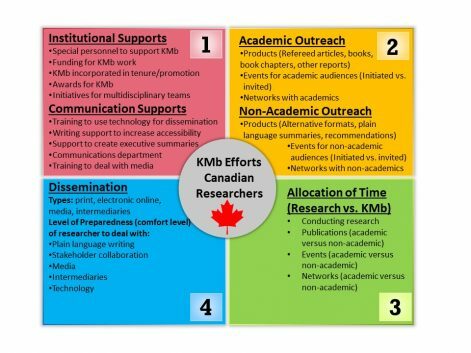 This study explores KMb practices of SSHRC researchers across Canada. This study used a survey to assess institutional supports for KMb as well as KMb practices of researchers. Few institutional supports are embedded at the institutional level, and those that are often not heavily accessed by researchers. KMb levels by researchers remain modest. 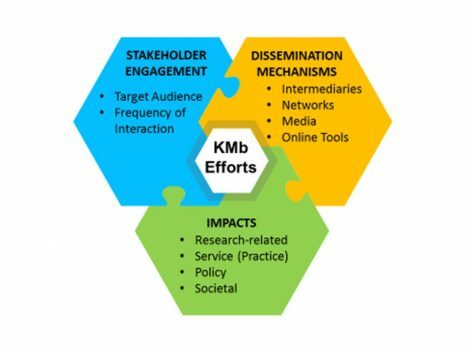 There is capacity-building efforts needed for researchers and universities to be able to engage with KMb and increase the impact of their work with different stakeholdes. Cooper, A., Rodway, J. & Read, R. (2018). Knowledge mobilization practices of educational researchers across Canada. Canadian Journal for Higher Education, 48 (1), 1-21 [70%, 20% Rodway, 10% Read]. Cooper, A. (2017). How are Educational Researchers Interacting with End-users to Increase Impact? Engaged Scholar Journal, 3(2), 99-122.